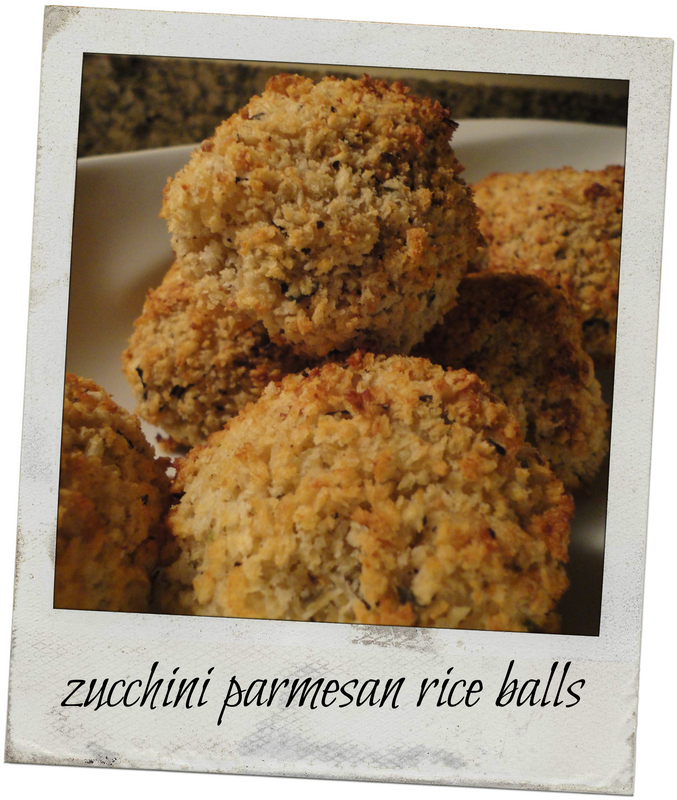 I recently made some zucchini & parmesan arancini (rice balls) in the traditional way (i.e. fried), and they were absolutely delicious. I’ve wanted to make them again, but I’m in the process of trying to eat a little healthier to shed some pounds, and fried food just doesn’t fit that bill. So last night I challenged myself to make the same delicious rice balls, but to bake them. Many times foods that are typically fried don’t transition well into the world of baking, usually lacking the “crisp factor”, but I was moderately confident that I could make it happen… and I was successful! So here’s my recipe for a healthier twist on rice balls, hope you enjoy. The first thing you’ll need to do is make the rice, and do so about three hours before you’ll be serving them. Why so long? Well, you need to cook the rice, then cool it in the refrigerator so you can shape it, and then bake it… So yeah, about three hours. One other note, you’ll notice that next to the chicken stock in the list of ingredients I have “room temp” shown. Even though we’re using similar techniques here, we’re not making traditional risotto so the stock doesn’t need to be warmed on the stove. However, you also don’t want to use cold stock right out of the fridge. If you did so, every time you add the stock to the rice it will halt the cooking process because you’re introducing something cold to the hot mixture. This leads to a gummy texture. That’s a big no-no! In a medium pot heat the olive oil on high. Once hot add the Arborio rice, salt, pepper and garlic powder. Saute the rice on high for three minutes, stirring periodically, then add one cup of chicken stock and reduce the heat to medium-low. Simmer the rice, uncovered, and stir regularly. Whenever the liquid is almost entirely absorbed add another half cup of stock. Continue stirring regularly and adding stock as needed. It should take approximately 25-30 minutes to get the rice fully cooked. Begin to periodically taste the rice to check for doneness once you hit the 20 minute mark. When it’s done it will be soft to bite but with just a touch of crunch in the center. Also, at this point the rice should have a slightly creamy texture, but not wet. If you still have a lot of liquid in the pot (which you shouldn’t!) then continue to simmer until cooked off. Once the rice is done remove it from heat and add the parmesan, shredded zucchini and egg yolk, stir well. Allow to cool at room temperature for about 20 minutes then place in the refrigerator for 1 hour, or maybe just a touch longer. You want the rice fully cooled before you start to form the balls. While the rice is cooling you can make your coating. In a medium bowl combine all of the ingredients shown above, stir well, then set aside. Once the rice is fully cooled it’s time to start forming the arancini. I used a 1/3 cup measuring scoop to maintain consistency in size, which yielded 8 portions. With your hands roll each portion into a ball, then individually put them in the bowl with the coating. Gently roll the balls in the panko mixture until thoroughly covered, then place on the baking sheet. Place the rice balls in the oven and bake until lightly browned, approximately 45-50 minutes. Remove from the oven and allow to cool for 5 minutes before serving. There you have it… Simple, delicious, and much healthier than the typical fried version! Serve them as a snack, an appetizer, or a side for your meal. Eat them as is or serve with a dipping sauce. I served mine set in a pool of ratatouille and it was delicious. You could also do regular tomato sauce, or even get spicy with a little Sriracha mayonnaise… Whatever floats your boat! Tags: arancini, baked, panko, parmesan, perfect pairings, perfect pairings at home, rice balls, zucchini. Bookmark the permalink. Previous post ← Chicken Avocado Salad… for sandwiches, salad, dip, whatever you want! I LOVE rice balls. I would even cheat on my diet for these. Maybe replace the broth with veggie broth, but still use the cheese…mmmmmm. Uh oh, I’m bringing you back over to the dark side!